There's a temptation, when reviewing a novel like The Long Earth , to dissect it. It's difficult to imagine two authors more distinct in their styles and preoccupations than Terry Pratchett—a fantasy writer whose humanist preoccupations often result in worlds that are skewed mirror images of our own, whose novels are almost baroquely detailed and peopled with idiosyncratic characters, and who is perhaps best known for being a humorist—and Stephen Baxter—a science fiction writer whose eye often seems to be fixed on events of inconceivably large scale, such as the evolution and extinction of entire species, who periodically destroys the human race in his novels, and whose characters often feel more like vantage points on these larger-than-life events than people in their own right. The idea of a collaboration between them seems to invite anatomization, as if we should be able to tell rather easily which parts of the novel are Pratchett's and which Baxter's. As a reader, I'm more familiar with the former's writing than the latter's, and though some of Baxter's adult novels have impressed me, I've been consistently disappointed with his YA work, which often relies on simplistic situations and broadly drawn, cliché-ridden characters. It seemed obvious, therefore, that a collaboration between him and Pratchett could potentially give us a novel that offered the best of both worlds. Pratchett, whose own monumental Discworld series has for several years been suffering from material fatigue, would benefit from Baxter's gosh-wow ideas and his planet-sized perspective, and Baxter would benefit from Pratchett's humanizing touches, his appealing character work and sense of humor. 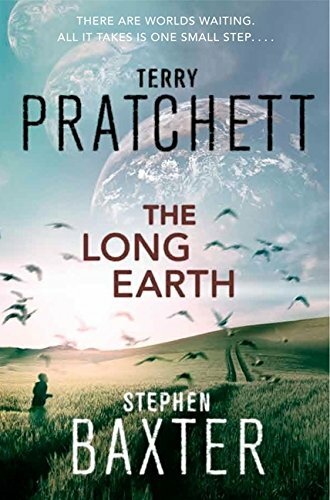 And yet for most of The Long Earth , I struggled to find Pratchett's influence in any but its most superficial aspects, and when I finally did find it, it was far closer to the core of the novel and its project than I had ever expected. The Long Earth begins in the near future, on a day when the schematics for a device called a Stepper—made up of some circuitry, a power source (a potato), and a three-position switch—are posted online. When the people who build the device—mostly gadget-happy kids—flip the switch, they disappear, and find themselves on Earth—a completely unpopulated, parallel Earth. Which is how the Long Earth—a seemingly endless stream of parallel, empty Earths lying in two "directions" (termed East and West) from our own, ripe for exploration and exploitation—is discovered. The rules are simple. Most people require a Stepper to make the journey, and it must be a Stepper that they built themselves—as one character puts it, the Stepper is "a kind of technological mandala, designed to tilt the mind into a subtly different state. . . . It is the act of making a Stepper that enables one to step, you see, not the gadget itself . . . it is unlocking a door within us that most of us don't know exists" (p. 161). Some people, who become known as "phobics," are incapable of stepping despite this process, while others, like our hero Joshua Valienté, are natural steppers, capable of stepping even without a device, and spared the disorientation and nausea that afflict most humans after stepping. That brief incapacitation, as well as the inability to carry iron over from one world to another, limit the speed with which humans expand across the Long Earth, but fifteen years after Step Day, Joshua is approached by representatives of the ultra-wealthy and powerful Black Corporation with the offer to join their founder—an artificial intelligence which has gained recognition as human by claiming to be the reincarnated soul of a Lhasan motorcycle repairman named Lobsang—on an expedition aboard a non-ferrous airship named the Mark Twain to "the High Meggers" (p. 20), the worlds millions of Earths away, to see, essentially, how far the Long Earth goes. There is, clearly, no small amount of Pratchett-esque zaniness in the novel's premise (which comes from him, originally handled in a 1986 short story titled "The High Meggas") and its characters, and yet for all that, The Long Earth doesn't feel at all like a Pratchett novel. Despite the occasional moment of humor (the potato powering the Stepper, a character who tolerates the nickname Pimple because "when your name is really and truly Percy Blakeney, pronounced 'Black-knee,' and you still have bad acne in your twenties, you accept Pimple as a nickname and are grateful it wasn't anything worse." (p. 137)), the novel's tone is sedate and contemplative. It lacks a strongly plotted throughline (though this is partly the result of its being the first installment in a series, even ending on a cliffhanger that sets up the next volume). Most of all, where Pratchett's novels are rooted in community, often an urban one—the bustling metropolis of Ankh-Morpork in most of his Discworld novels is the most obvious example, but even in entries like the recent, non-Discworld novel Nation (2008), which not only takes place on a remote Pacific island but begins with the death of all but one of its inhabitants, the importance of that destroyed community and culture is paramount, and lingers over the novel's characters— The Long Earth is a novel that very quickly eliminates all human presence except its protagonists from its pages, and seems primarily concerned with the natural landscape and its protagonists' desire to become lost in it. While the novel's early chapters are concerned with charting the ways in which humans expand across those portions of the Long Earth nearer to the original (which becomes known as "Datum Earth" or "the Datum"), switching from one point of view to another to capture different aspects of this expansion, most of the novel is taken up with Joshua and Lobsang's solitary journey. The earlier chapters are nevertheless worth examining, since they highlight some rather strange preoccupations on the authors' part. In their afterword, Pratchett and Baxter explain their choice to center their story on the American city of Madison, Wisconsin by revealing that they attended the North American Discworld convention there in 2011, and used the opportunity to research a setting. This does not, however, quite explain why two British authors should have chosen to write a narrative of colonization that draws so blatantly from the tropes of American Western (which is also the stepwise "direction" Joshua and Lobsang choose for their expedition) expansion, right down to the explicit, unironic, and, because the stepwise Earths are unpopulated, completely unproblematic invocation of Manifest Destiny. All of these elements of Datum Earth's response to the discovery of the Long Earth—the disappearance of the dispossessed, the new pioneering era, the reemergence of Manifest Destiny, and a burgeoning anti-Stepper movement that arises among phobics—are, however, allowed to fade away as soon as Joshua and Lobsang set out on their journey. The bulk of The Long Earth , in fact, is centered around that journey, which turns out to be a weirdly compelling decision. It results in a novel that is almost entirely shapeless—Joshua and Lobsang, who has been ported into an android body, explore the Mark Twain 's lavish facilities, needle one another in mild ways, and exposit to one another about the history of Long Earth exploration (mostly this is Lobsang expositing to Joshua, as he reveals the results of his research into instances of natural stepping that occurred before Step Day). But for the most part, what they do is explore, noting strange shifts in geography, flora and fauna, marveling at the occasional "joker" worlds, where some quirk of planetary development has rendered the Earth massively different (and usually uninhabitable), and even discovering the terrifying Gap, an alternate universe in which the Earth doesn't exist and the Mark Twain pops momentarily into the vacuum of space. Most intriguingly, Joshua and Lobsang discover that though the Datum is the only place where humans evolved, the Long Earth is populated by several species of intelligent, tool-using hominids whom they term "trolls" and "elves," most of whom are natural steppers, and spend some time studying their culture and theorizing about their evolution (mirroring the convenience of the absence of permanent settlements on the stepwise Earths, these hominids are hunter-gatherers who are not concentrated on any particular Earth, with little in the way of language or culture as we understand them, and are thus not a hindrance to humanity's colonization efforts). To once again indulge the anatomizing impulse, these are the portions of the novel that feel most distinctly Baxter-ish (which, since they make up the bulk of the novel, means that his mark is stamped across most of it), but whether or not that interpretation is correct, they show us the authors diving headlong into the sheer fun and endless possibilities inherent in their premise. When the Gap is discovered, Lobsang waits but a moment to recover from his terror after stepping away from it before immediately realizing its implications—the ability to launch into space without the cost and risk of achieving escape velocity; the opportunity to explore, for example, the Long Mars. In fact, reading these chapters, one is almost inclined to wish that there was less Pratchett in them, or rather, less character stuff. The pairing of Joshua and Lobsang most closely recalls the drone/Special Circumstances operative partnerships from Iain M. Banks's Culture novels, but it is nowhere near as equal (or as prickly) as these relationships usually are, and the novel's focus on it thus feels unearned. The authors hang a lantern on Joshua's uselessness to the expedition—the Mark Twain can not only step without him, but can do so much faster than he ever could, traversing tens of thousands of Earths every day—by having Lobsang explain that he's brought Joshua along as a failsafe, someone who can bring his memory unit back to the Datum if some disaster should befall the ship. This, however, only intensifies the sense that Joshua plays no role in the novel except as a receptacle for Lobsang's infodumping. Meanwhile, Lobsang himself is never entirely believable as either a human soul or an alien one pretending to be human. When Joshua goes exploring on one Earth and is nearly killed by violent hominids who leave him badly injured, Lobsang insists that "You do realize you were never in any real danger, don't you?" He rubbed his throat. "It didn't feel that way at the time." "I could have taken out those elves individually at any time. I have advanced laser sighting on—"
"You'd asked for shore leave. I thought you were enjoying yourself!" It's an exchange that falls flat no matter how you slice it. It isn't very funny, Lobsang's claim of infallibility isn't terribly convincing, and Joshua's annoyance at it is far too mild for the situation described. All it achieves is to drain the tension out of Joshua's later misadventures without developing either his relationship with Lobsang or our understanding of Lobsang's personality. In his own novels, particularly Nation and the Discworld novel Small Gods (1992), Pratchett has laced his humanist principles with a strong dose of atheism. But at the same time, his novels are almost always set in an intentional universe. Even if there isn't a god, there is some force directing humanity towards, if not a purpose, than at least a narrative. You'd think that science fiction, and particularly Baxter-ish science fiction, with its emphasis on environments that dwarf individual humans, wouldn't support such a universe, and yet as statements such as Sally's reveal, The Long Earth takes place in one, and one of the core questions of the sequence it launches will be to unravel the intention that underpins the Long Earth phenomenon. The Long Earth ends with an abrupt return to the concerns of the Datum Earth which filled its early chapters. As Joshua and Sally make their way back to the Datum, we discover that anti-Stepper, "Humanity First" groups have escalated their activities to the level of exploding atomic bombs in the middle of cities. Though the novel gets some mileage out of the revelation that Rod Green is one of these terrorists (if nothing else, it goes some way towards addressing the weirdly forgiving attitude that the novel, and everyone around them, takes towards the Greens' decision to, essentially, abandon their disabled child when his disability gets in the way of their life plans), this does nowhere near enough to address the inherent absurdity of this plot twist—that people who are incapable of leaving Earth would choose to destroy and irradiate the only planet available to them in order to get back at people who can simply step away from the bomb blast. It's a poorly thought-out twist that deserved more consideration and more groundwork than Pratchett and Baxter give it here. What's more, it's a twist that seems to promise that whatever form The Long Earth 's sequels will take, they will be very different from the shapeless, exploration-focused narrative of this novel. For all its compelling parts, as The Long Earth ends, it's impossible to get a sense of what its whole will look like, and whether the more successful parts of the novel will play a significant role in it. "A loudspeaker! Lobsang, booming from above like Yahweh." "The equipment is merely practical, Joshua. Not every action carries symbolic freight." It's a nice exchange to quote both because it encapsulates the pair's relationship—Joshua rather sceptical of the being that has hired him, Lobsang supremely confident in his equipment and intellect—and because The Long Earth itself is heavily loaded, probably overloaded, with symbolic freight. Parallel worlds are usually there to make a point—in recent SF, think of the way Paul McAuley uses them to critique American imperialism in Cowboy Angels (2007), or how Ian McDonald argues them as a window into the multifarious identities of his Brasyl (2007)—and there's an equally clear frame in place here. The bulk of The Long Earth is set in the areas equivalent to the United States; the worlds of the Long Earth are empty of Homo sapiens ; and Joshua and Lobsang travel "West" across them, on a voyage of discovery. It is a new frontier story. This does lead with rather tedious predictability to the failing of very many SF stories that invoke the American frontier experience—Felix Gilman's The Half-Made World (2010) comes to mind—which is to say, trouble with the natives. The Long Earth may be empty of us, but there are other species of humanoid out there, also able to step between worlds. In fact a major plot point in the second half of The Long Earth is that these humanoids are being driven Eastwards—towards Datum Earth—which provides plenty of excuses for Joshua and Lobsang to interact with them, and start to work out how much they think, and how much social organisation they have. All of which is well and good as SF, certainly. Baxter at least has form for provocative exploration of the line between human and not, most memorably in Evolution (2002), but also in Origin (2001), another many-worlds tale. But such a move seems rather ungenerous when said humanoids are occupying the narrative space where actual humans once stood. Acknowledging that "the notion of Manifest Destiny is historically suspect, of course" (p. 91) doesn't quite seem enough, particularly when one attacking band are described as "whooping and hooting" (p. 197). There is, it's true, a secondary frame for the humanoids, created when Joshua and Lobsang start naming the species they encounter after creatures from folktales: Elves, Trolls, and so forth. This also proves to be quite neat as speculation, enabling a riff on the old notion that magic went away—that humans gradually drove the other humanoid races away from the datum. But once again, it has uncomfortable metaphoric implications. It would help, quite a lot, if we ever saw through humanoid eyes; but in this novel at least we never do. They remain narrative devices rather than characters. The lack of comment on this reading of the humanoids is a little odd, because in other ways The Long Earth is quite a self-conscious novel. Joshua and Lobsang are not blind to the antecedents of their journey, and the larger artifice of the Long Earth itself is central to the plot, with most of the characters passing comment, at some point, on the neatness and timeliness of the whole arrangement. Indeed the goal of the Mark Twain 's voyage is basically to find out what gives, how something so cosmologically convenient for the crowded and resource-stressed humanity of the twenty-first century can possibly have been revealed at just the right time. All of which means that in the course of their travels, Joshua and Lobsang start to encounter various answers to the question of what happens next, how humans might start to live in the Long Earth. Two possible outcomes are given particular prominence, linked to two ways in which the vast expanse of Nature that seems to define the Long Earth is characterised. On the one hand, there is a sense that these worlds are Edenic, a rescue from the fall, unspoiled. "The very air was different. Rich. Heady" (p. 34). A space so enormous that there might be no need for what we understand as modern life (the assumption that what we understand as modern life is driven by need rather than desire should be noted): "We have no need of agriculture, to sustain our mighty numbers. Do we have need of cities, then? Of literacy and numeracy, even?" (p. 236). And a space that is, somehow, intended, a gift to humanity in our hour of need, perhaps from the looming intelligence that Joshua can always sense, the "distant, deep presence behind the clutter of worlds" (p. 50) that the boy raised by nuns is careful not to call God. At the same time, the Long Earth is wilderness, "Nature, the real thing" (p. 45), a canvas, ready for humanity to work with all over again. As soon as the worlds are revealed, we learn, humanity begins to exploit them. So it goes. The middle classes annex plots of land one world over as extended gardens; the gold rush is re-enacted dozens of times (causing the Datum Earth market to collapse, inevitably); and pioneers set out to build new lives worlds away. Whether or not this is meaningfully new or re-enactment becomes a point for debate. Not in the agenda-driven sense of something like Kim Stanley Robinson's Mars trilogy, whose characters actively strive to enact newness in their frontier; Joshua and Lobsang are largely observers, passing through. But reacting to one community, Joshua feels strongly that it "wasn't some recreation of pioneering days past . . . [but] something new in the world" (p. 332); even if the suggestion is pooh-poohed by his companion at the time, who insists that the cityless hobo hunter-gatherers are the future. What these two visions of the worlds have in common—and where they dovetail both with the narrative quest of the Mark Twain , with all its symbolic freight, and with the revealed science-fictional logic of the Long Earth—is that they ask readers to consider the ways in which humans do or should enact their will on the world. Political and moral questions arise from how the environment is understood, how humans are shaped by it, and how they choose to shape it and live in it. Crucially, for all that the characters talk about newness and emptiness, the Long Earth does not allow a blank slate; all of its outcomes evolve from existing human contexts. The pioneers happen to be largely nice middle-class types with the means to choose to escape the world; the hunter-gatherers are more likely to be the poor who may have to. And there is a notable amount of rumination about how the Long Earth may affect the human psyche—it's a kind of post-scarcity, it's suggested, where there is enough space, and therefore enough stuff, for everyone to have theirs without needing to compete. But whether that story will carry the day remains an open question at the end of this novel, because there is a competing narrative, shaped back on Datum Earth by those unable to travel the worlds, and who feel like neanderthals being out-competed as a result. So The Long Earth has its symbolic freight on display throughout, for the reader to sort through and make of what they will; and sometimes that's uncomfortable, and sometimes it's thought-provoking. It's an odd mix, in other words. But it's also a skillfully enough constructed novel that the pages flow by easily, the narrative skipping back and forth in time, and between characters with graceful confidence. Almost always it feels like a coherent work, with a sense of purpose, which is not always a given with collaborations—although inevitably there are moments that seem to belong purely to one or other of its authors. I couldn't quite believe it was Baxter's hand, for instance, that described Joshua's personal Four Horsemen as, "Greed, Failing to Follow the Rules, Confusion and Miscellaneous Abrasions" (p. 50); whereas the stop-motion effect of flying over a sheaf of worlds in ice ages didn't seem like core Pratchett: "In each world, the great ice sheet covering Eurasia must be pulsing, ice domes shifting, the Southern edge rippling back and forth century by century: he was passing over snapshots of that tremendous continental flux" (p. 120). Then again, there is also some quite extraordinarily broad Brit-kitsch—a Prime Minister who refers to "the science chaps," Lobsang doing a turn as a butler, a parochial English village—that, if I didn't know better, I would assume was written by Americans. Perhaps it's sufficient to say that while this gentle, flawed novel may not be the best of either of its authors, on balance it seems a book that neither could have written alone; and that may make the journey worth continuing. Interesting that Abigail should choose that quote after Joshua's fight, because that incident seemed to sum things up for me too but for different reasons. For all the sense of space, it all feels just a little too cosy. The exploration pulls the plot (such as it is) along, but there's no real sense of danger or need pushing it from the other direction. Lobsang's this all-seeing-eye and even when Josh was being attacked it didn't feel genuinely dangerous so much as a dramatically necessary moment of 'mild peril' (to quote my Incredibles DVD cover). As a single book this was all a little beige. As the start to a series I'm having to take a hell of a lot on trust. Personally speaking there aren't many other authors who've done more to earn that trust than these two, but I still really can't decide if they're going to amplify each other or cancel each other out. The premise reminds me of Robert Reed's Down The Bright Way, which also features a vast set of parallel earths arranged in a line (you can go up or down the bright way between worlds). In Reed's book many of them aren't uninhabited, and "our" earth isn't the one who discovered how to travel between them. Reed uses this device to explore themes of cultural and political intervention.